Bose SoundDock II review | What Hi-Fi? Given Bose's reputation for expensive kit, you might be surprised to find this dock sitting at the affordable end of the market. And, seeing the price tag, it comes as no surprise to find that features and functionality are thin on the ground. Apart from a basic remote and 3.5mm auxiliary input, there's little to get excited about. Then again, the main focus of this test is on sonic ability, not which unit has the most features. The Bose feels reasonably sturdy and well-built. Look closely and you can see the twin drivers and other components behind the grille on the front of the unit. This is either interesting or offputting, depending on your preference. The iPod dock protrudes from between the unit's speakers and finds itself flanked by a volume button on either side. The remote is simplistic but the large, round, rubberised buttons are responsive and allow you to skip through playlists. Unfortunately, the remote doesn't let you navigate through the other menus on your iPod and select tracks by artist or genre, which would be of more use. For its size, SoundDock II produces an impressively broad and expansive soundstage, even when the source music is relatively compressed. Rock out to 320kbps of Guns N' Roses' Paradise City and guitars, vocals and drums are tidily organised. The Bose does a great job of keeping all the elements coherent and distinct. 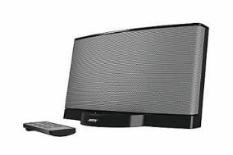 The SoundDock II is also surefooted with its timing. Spin The Temper Trap's Sweet Disposition and the agile, rolling drumbeat has your toes tapping. Bass notes sound solid and defined, although other docks in this test can delve deeper and exhibit a greater sense of scale. Having said that, the SoundDock II has no problems filling an average-sized room and just about retains its composure at high volumes. If you're looking for an affordable, musical iPod dock then the SoundDock II is a good place to start.